Tostadas with Chicken Beans and Guacamole are perfect for an easy weeknight dinner! These tostadas are loaded with layer after layer of deliciousness and you’ll be savoring every bite. Plus it’s a recipe everyone can agree on. It’s been a while since I’ve made tostadas and now that I’ve made them again I’m wondering why they aren’t on regular rotation around here. For this recipe I used my families favorite canned refried beans. Rosarita Traditional Refried Beans are a go-to product around here (and you can find them at Walmart). We always heat them up with cheese and spices as a dip for tortilla chips and my kids frequently request them as a side to their lunch. Then another product I love which I used here are Ro*Tel Original Diced Tomatoes & Green Chilies. You can add a can of those to just about any Mexican or Southwestern dish, right? They work perfect for this recipe. How do You Make Tostadas? Mash avocado with lime juice and 1/8 tsp garlic powder, S&P. In a saucepan mix refried beans, tomatoes, chili powder, cumin and remaining 1/8 tsp garlic powder, S&P, heat through. 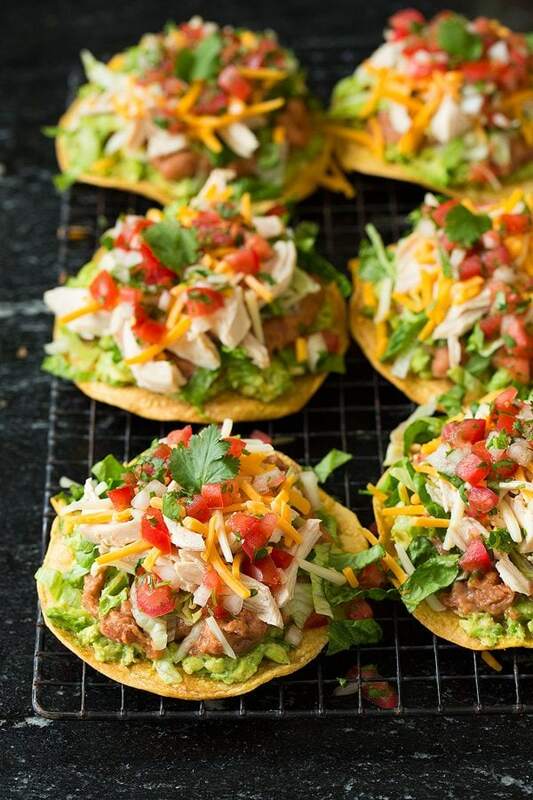 To assemble tostadas, layer each tostada shell with guacamole, bean mixture, lettuce, chicken, cheese, pico de gallo and sour cream. How do You Make Homemade Tostada Shells? Bake on a rimmed baking sheet about 4 – 5 mins per side until crisp. These tostadas are perfect for an easy weeknight dinner! 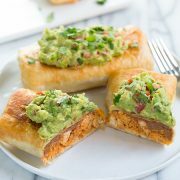 They're loaded with layer after layer of deliciousness and you'll be savoring every bite. Plus it's a recipe everyone can agree on. 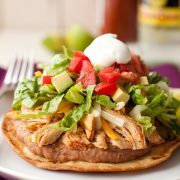 Save time by using store-bought tostada shells, pico found in the deli, and store-bought rotisserie chicken. Using a fork mash avocado with lime juice and 1/8 tsp garlic powder to a slightly chunky texture. Season with salt and pepper to taste. In a small saucepan mix together refried beans, drained canned tomatoes, chili powder, cumin and remaining 1/8 tsp garlic powder. Season with salt and pepper to taste and cook over medium-low heat, stirring frequently until heated through. 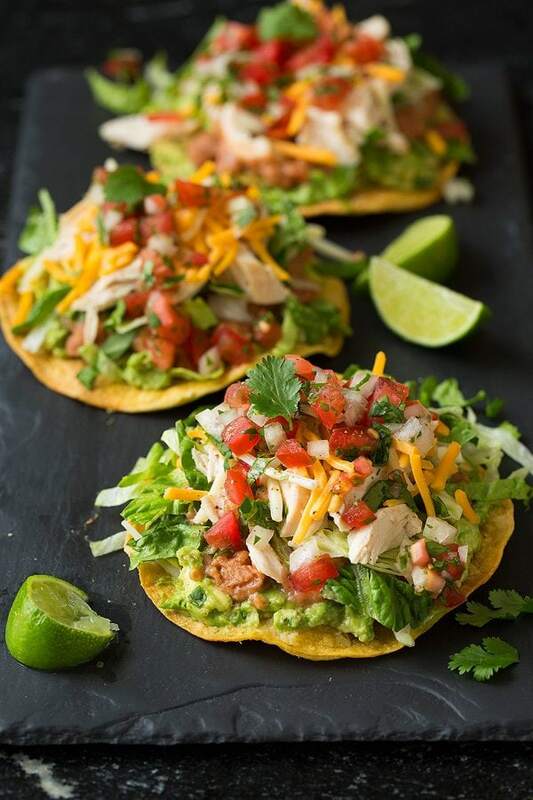 To assemble tostadas, layer each tostada shell with guacamole (avocado mixture), bean mixture, lettuce, chicken, cheese, pico de gallo and sour cream. Serve immediately. The store-bought tostada shells can usually be found by the tortillas. If making the tostada shells yourself preheat oven to 400 degrees. Brush both sides of 6 yellow corn tortillas lightly with olive or vegetable oil (about 1 Tbsp total). Season lightly with salt then bake on a rimmed baking sheet about 4 - 5 mins per side until crisp. 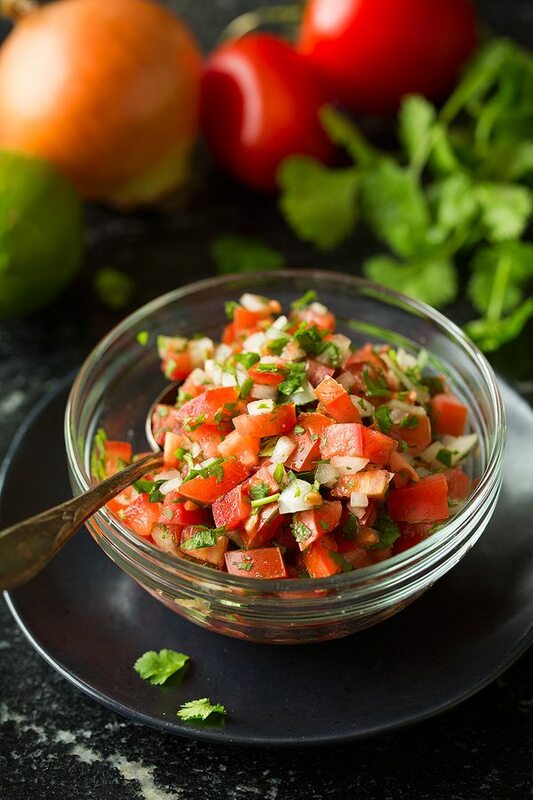 For homemade pico de gallo - in a medium bowl toss together 2 diced roma tomatoes, 3 Tbsp diced yellow onion, 2 Tbsp minced cilantro and 2 tsp lime juice. Season lightly with salt and pepper. This post was sponsored by Mirum Shopper, however all thoughts and opinions are my own.